NJUST 2 (Nanjing University of Science and Technology 2) is a 2U-CubeSat in the TW 1 (Tianwang) constallation consisting of three CubeSats for space networking experiments. 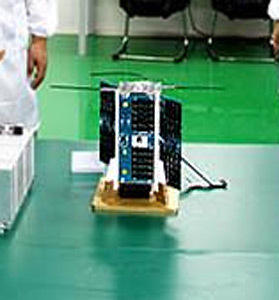 Three satellites, Shangkeda 2, NJUST 2 and NJFA 1, are part of the constellation, which was developed at the Shanghai Engineering Center for Microsatellites (SECM) in collaboration with Nanjing University of Science and Technology (NJUST), GomSpace from Denmark, Tekever Space from Portugal and NanoSpace from Sweden. NJUST 2 was developed and built at the Nanjing University of Science and Technology (NJUST). NJUST 2 carries an AIS receiver payload. The three satellites will test inter-satellite communication sessions using the GAMALINK tchnology developed by Tekever. The three satellites were launched together on the maiden flight of the CZ-11 rocket into a sun-synchronous orbit at an altitude of 481 km.